Johnny Apollo along with Jane Apollo and Mark Apollo (in the UK) made up an astronaut team and was produced by Marx in the late 60's. I was lucky enough to be the high bidder - I really thought it would go for much more and was prepared to pay well into $300 for it. Why you may ask? First a little background - the Johnny Apollo toyline was produced by Marx between 1968 and about 1970 - the original boxed toy was simply called "Johnny Apollo Astronaut" (white plastic suited figure with "flesh" colored hands and face with gold accessories) and was marketed shortly after its release with a female astronaut "Jane Apollo" (blue plastic suited figure with "flesh" colored hands and face with white accessories) - they could be purchased separately, with one of two vehicles (Space Crawler or Moon Rover also sold separately or with the Johnny figure) or a deluxe "Lunar Exploration Set" that included both figures and both vehicles. There are variations of the figures - Johnny was marketed as "Mark Apollo" in the UK and was molded in orange plastic, rather than white with white accessories. There are also some various Mexican knock-offs in white with blue or silver accessories and a handful of prototype figures floating around with silver plastic suits (I own a Jane complete with Marx tag). 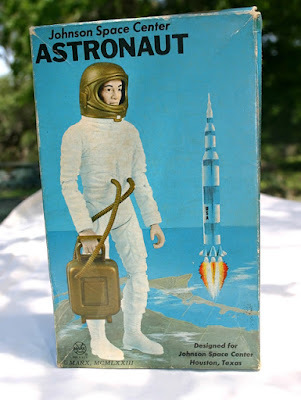 Besides the Johnny Apollo box, there is a fairly common "Cape Canaveral Astronaut" variation that had different box artwork and instructions, but was otherwise the same as the Johnny Apollo boxed figure. I have never seen Jane in any form other than the Jane Apollo box, nor have I seen a UK variation (Jane is found as a Mexican knock-off, however). Now to the meat of the story - I had only heard about this Johnson Space Center version from one other collector, Keith Meyer in Arkansas - he owns a copy of the instructions - from that we surmised that the actual figure exists but neither had ever seen the box. That's why I became so excited when this one presented itself on eBay - as far as I know, I don't believe any of my space collector friends has this variation. I can only assume that the Johnson Space Center only carried it for a short time, or perhaps the store there was only open for a limited time - I really don't know why it's so rare. I am very happy to include it in my collection, though. Once Paul and I complete the new Triang SpaceX/Golden Astronaut pages for the wildtoys site, I'll be tackling one devoted to Johnny Apollo. Rare Mark Apollo - my latest eBay Find!